After I read Germinal a couple of years ago (see my review), Émile Zola became one of those authors that I really wanted to read more of, but it was not until I saw the BBC series based on The Ladies’ Paradise and read the novel (see my review) that I decided to begin a long-term project to read them all. I’ve enjoyed reading this one, The Fortune of the Rougons, which puts the whole sequence into perspective. With Les Rougon-Macquart, Zola apparently set out to emulate Balzac’s La Comedie Humaine but his 20-volume cycle differs in two significant ways: it consists of novels rather than short stories and novellas, and it focusses on a single family rather than a whole society. Zola believed in the fatalistic effects of heredity and environment, and so the novels trace three branches of the Rougon-Macquart family: the aspirational Rougons, always on the hunt for wealth and position; the Mourets, who are bourgeois tradesmen and provincials; and the low-born Macquarts who are industrial workers. (Or worse). The Fortune of the Rougons charts the lives of the first generation. (There’s a helpful family tree at Wikipedia). Adélaïde Fouque (Aunt Dide) – who is a bit loopy, has three children: Pierre Rougon, the legitimate son of her long deceased labourer husband, and Antoine and Ursule who are the children of her liaison with the smuggler Macquart. By the end of the novel Pierre and his ambitious wife Felicité Puech have with a mixture of good luck and cunning overcome their disadvantages and achieved their destiny as influential leaders in the town. Ursule (who marries Mouret) and the drunken layabout Antoine have been swindled out of their inheritance, and are relegated to their respective paths in life. The novel begins with the naïve idealism of a young couple who have enlisted in the doomed insurgency that led to the December 1851 coup d’état that created the French Second Empire under Napoleon III. (Fortunately, the reader does not need to know much about the interminable revolutions of this period, but if you are keen, you can start at Wikipedia, or try A Traveller’s History of Paris by Robert Cole which has the only explanation I’ve ever enjoyed reading.) Ursule’s son Silvère Mouret and Miette have been sweet on each other since childhood, and they are out canoodling around the periphery of the town when they are swept up into the insurgency. The rude comments of some of the militia reveal that both have grubby forebears, particularly Miette whose father, a poacher, was executed for killing a gendarme. 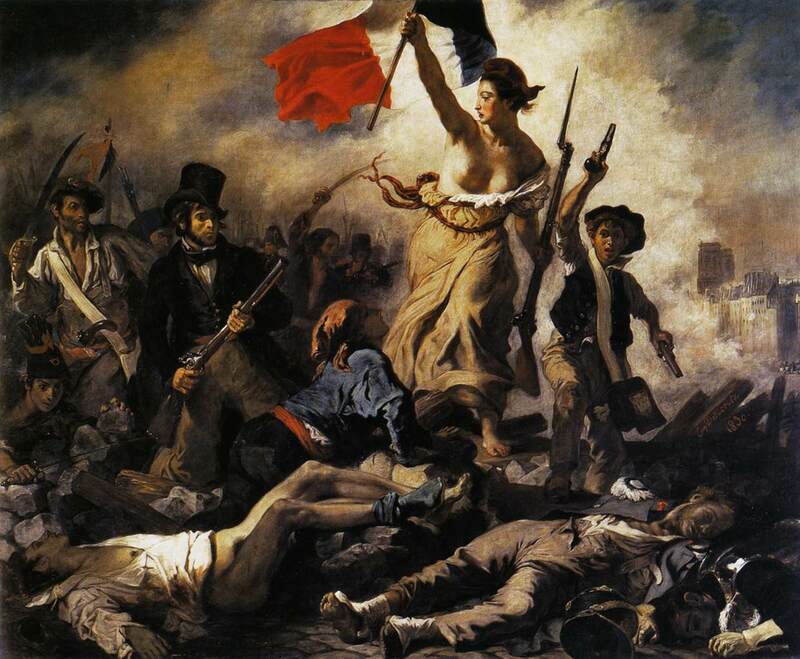 This unpleasantness doesn’t, however, deter Miette from joining the compatriots: in a scene reminiscent of Delacroix’s Liberty Guiding the People she takes up the role of flag bearer so that she can be with Silvère, and off they go. While Zola’s sympathies are obviously with the rebels and against the cynical government in Paris, I wondered whether this allusion was meant to suggest that as things turned out politically in this period, Liberty herself was alas, as naïve as Miette was. In the next chapter Zola then abruptly abandons these two to tell the story of the Rougons, launching into Adélaïde’s imprudent marriage to Rougon. Adelaide was the daughter of a market gardener, and could have made an advantageous marriage even in Plassans where the options are limited, but no, she fancied Rougon who was a labourer on her father’s land. After his death she formed an eccentric liaison with the alcoholic Macquart and bore him the two children, Antoine and Ursule, before he disappeared and died as well. Pierre resents having to share his inheritance with these two and cunningly arranges affairs so that he doesn’t have to (which isn’t hard because by now Adelaide is well-and-truly unhinged). Antoine never lets Pierre forget the swindle, much to Pierre and Felicité’s embarrassment. For with money behind him Pierre makes an aspirational marriage and they soon set about ingratiating themselves with their ‘betters’, a tactic which isn’t helped by the drunken Antoine casting accusations at them whenever he gets the opportunity. In this way Zola reinforces the town’s doubts about the legitimacy of Pierre and Felicité’s position throughout the novel, culminating in the closing paragraph with overt symbolism to show that they have blood on their hands, thus making a veiled critique of the legitimacy of Napoleon III’s crown. According to Zola’s recommended reading order (which isn’t the same as the publication order) I’m supposed to read Son Excellence Eugène Rougon next … but I need some advice about which translation to get because Brian Nelson hasn’t done that one. 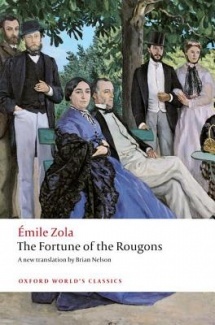 This entry was posted in 1871, Émile Zola, Commentary, English, Lisa Hill (ANZ LitLovers), Nelson, Brian, No 1 and tagged Émile Zola, The Fortune of the Rougons. Welcome! That’s one I have yet to acquire … which translation do you have? Do you recommend it? “I wondered whether this allusion was meant to suggest that as things turned out politically in this period, Liberty herself was alas, as naïve as Miette was.” This is a good observation, and might explain why Miette and Sylvère felt forced to me, despite the fact that Zola took a great deal of care fleshing out their romance. They don’t feel lived in by the author, for lack of a better description. The evil, stupid characters in the book on the other hand, even the minor ones, do – and with apparent zeal and relish! From the very beginning, it was far two obvious Miette and Sylvere were being fattened up for the kill, and that that was their sole purpose for existing – to embody an idea. I think Zola could have concealed that better and achieved the result he wanted more subtly, because I’ve now seen him do it a number of times. I wonder if he simply felt too strongly about this particular idea to be able to do that? That would make sense, as the strength of his writing really seems to be in using dispassion to generate a very powerful emotional impact. Just finished ‘The Fortune…’ today and taking a little breather before moving on to ‘The Kill.’ It was really great – so wickedly funny, and awful at the same time! Grubby, greedy little people. Still horribly relevant today. Oh, I agree, Zola is always much better at his less noble characters!